This is the 3rd year the Green Heart Foundation has been inviting everyone to the Casino Night in Jefferson. The event benefits the Toys for Tots in Marion County. You can buy your tickets early by calling Ned at 903-930-4769 or Betsy at 903-424-5756. Or you can purchase at the door, but if you want to have dinner I’d strongly suggest you call and book your seats early. High Roller tickets are $50 per person and include your seat, a steak dinner and $100 in chips to get you started gambling. Or if you have 7 friends all going, a full table which seats 8 people costs $350. 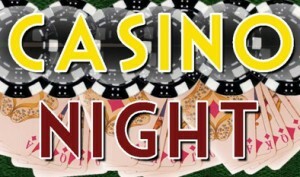 Gambler tickets are $65 per couple or $35 for a single ticket; this includes $100 in chips per person. These tickets do not include dinner so come at 8:30 pm to begin gambling. The evenings schedule begins with a cocktail hour from 6:30 to 7:30PM then entertainment with dinner from 7:30 to 8:30PM. The DJ and game tables will begin at 8:30PM and rounding out the evening at 11:00PM the Live auction begins where you’ll bid on items and paying for them with your winnings. So blow on those dice, rub that rabbits foot or kiss that lucky charm; whatever it takes to win big. Good Luck!